The Crazy Bookworm: The Stylish Blogger Award X4! Wow! 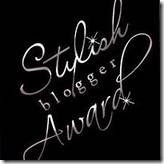 I received The Stylish Blogger award 4 times! Thank you to: Liddy @ Lovely lil Bookworm, Steph @ Short and Sweet Reviews, Megan @ Xenophobic Bibliophile, and Faye @ The Book Angel. Thans guys for giving me this wicked award!! 4. Contact these bloggers and let them know they have won! 3. I love to write! 5. I am a huge movie finatic. 7. And...I am a proud aunt to an 8 month old baby girl named Ella. SLD:FJSLKDJ *Spazzes* Thank you so much for the award, and congrats on receiving it so many times! :D That's so cool that you own your Pet Spa business. I'm a huge dog lover too, but I only have one dog--a runt of a bichon frise named Lulu.